XRF has an extensive offering of Control Arms that have been re-engineered for long-life. 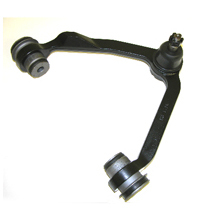 XRF Control Arms have the same super-duty, super-strength ball joints that we offer for standard replacement. There are no short-cuts to make a cheap part. For many control arms that OEM offer only as a complete unit, XRF has redesigned so that once an XRF control arm is installed, only the ball joint needs to be purchased for subsequent replacements.